Day Two. After an early(ish) breakfast in the hotel we will start our journey back to the coast. The route is rolling (but not too steep...) through the Normandy countryside (La Suisse Normande), on quiet roads and tracks. 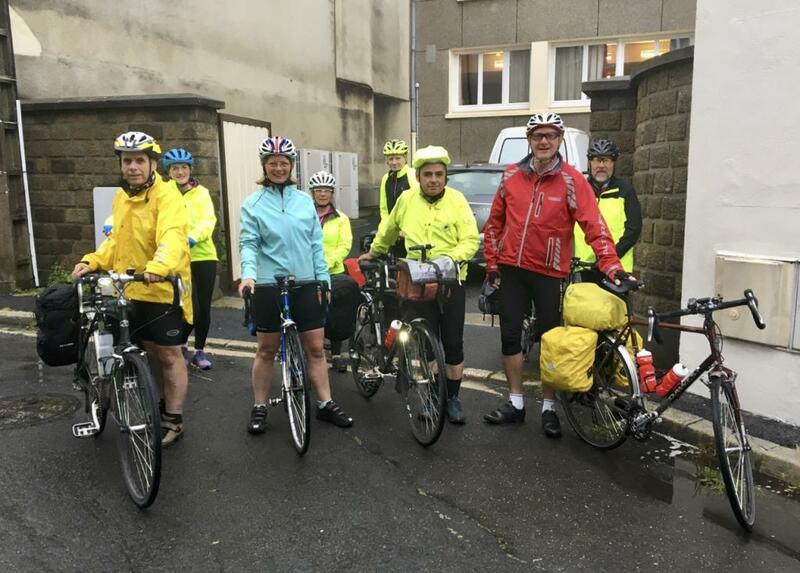 We will crack on through and aim to have lunch in Caen, giving us plenty go time to enjoy it before the last few flat miles along the canal to Ouistreham and the ferry. Don't forget to bring decent lights as we will be disembarking from the ferry in the dark. Day Two started with an early breakfast, accompanied by some anxious perusal of numerous different Smartphone weather Apps. The general consensus was that we were due to get wet, which proved to be a pretty accurate assessment. Once more we were aided in the early part of the day by a helpful tailwind, although the constantly changing weather (jacket on, jacket off) was slightly irritating. As we moved off the larger roads on the approach to Lassy a dog in the road (could it have been Lassie?) caused Karen T to take a nasty tumble as her front wheel slid under braking and she crashed. 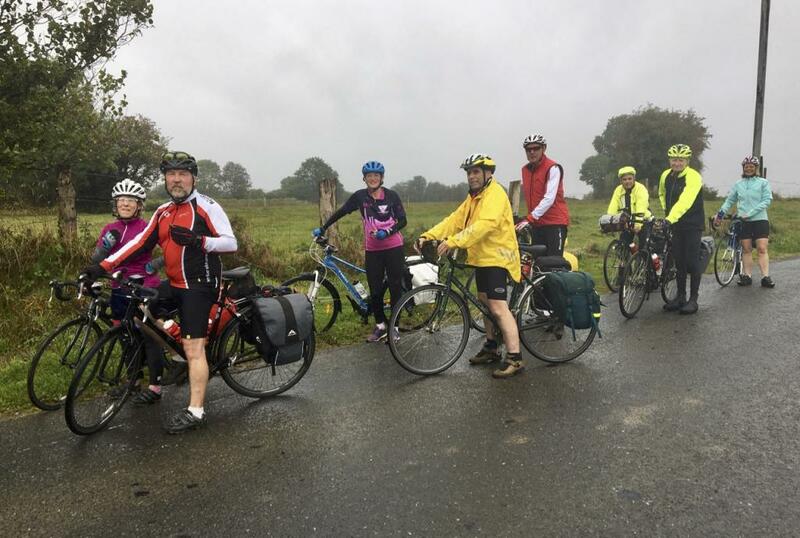 One cracked helmet and a very sore shoulder and left side later she clambered bravely back on her bike and we continued rather more slowly though the hills of La Suisse Normandy towards Thury-Harcourt. On the way we discovered the Voie Verte that follows an old railway line right to the coast had been extended beyond Thury-H and so we dropped onto it gratefully and trundled towards the sea. 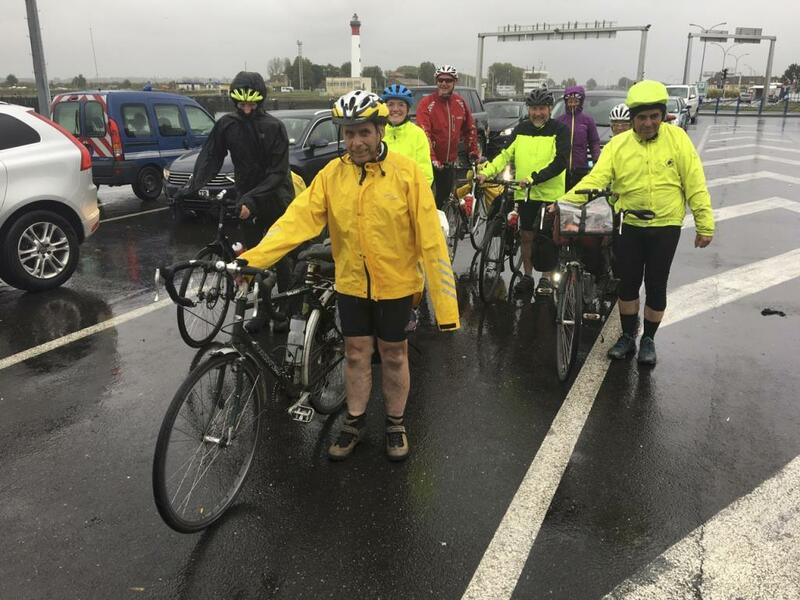 After a brief stop at Thury-Harcourt we decided that, due to the increasingly rubbish weather and a freshening headwind, we would crack on through to Ouistreham. That we duly did, arriving at the ferry drenched once more but hugely pleased to have completed the trip in fine style - and yes, John's manner covers were still in place, and very effective. Croques Monsieur, coffee, frites and other delicacies were consumed with glee before we embarked on the ferry for home. During the voyage it became clear that Karen was no longer in a position to ride her bike off the ferry. Brittany Ferries came to the rescue and moved her and the bike to the passenger terminal while the rest of us disembarked normally and picked up our cars from Whale Island before heading for home. Overall, despite the rather unfriendly weather, it was another excellent and very satisfying trip. Thanks to one and all for making the leader's life so easy (all I did was ride at the front) and for being part of making it so much fun. I plan to repeat the trip again next year, but with a slightly different route and theme. 2019 is the 75th anniversary of the D-Day landings, and so next year's ride will start and finish in Ouistreham. Day 1 will include a series of D-Day 'stances' along Sword, Juno, Gold and Omaha beaches before an overnight stay in Bayeux. Day 2 will continue via Caen and Pegasus Bridge among others. Watch the website for more details early in 2019. Leaving the hotel in Vire. 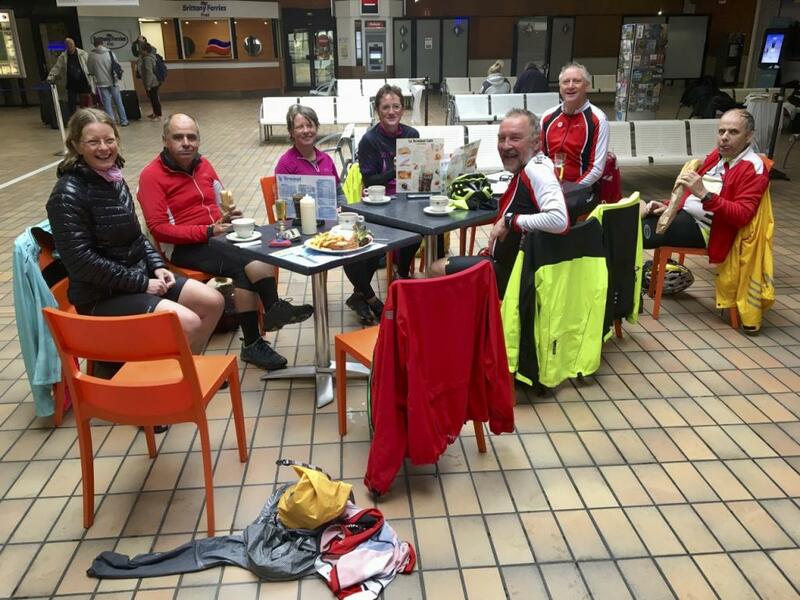 Drying off and refuelling in the ferry terminal. Waiting to embark while enduring a final rain shower.